Behold a far spot in the universe.  The picture above—of radio emissions coming from a jet of particles, accelerated to nearly the speed of light by the gravitational power of a black hole more than 900 million light-years away—represents the highest-resolution astronomical image ever captured, its creators say. The astronomers just published their data in the Astrophysical Journal. Admittedly, it may not look like much to the naked eye, but for what it is, it’s pretty cool. The BL Lacertae (BL Lac) galaxy is far away, and these radio emissions are weak. The picture is compiled from signals collected in November 2013 by the Spektr-R satellite of the RadioAstron mission and 15 radio telescopes on Earth, nine of them part of the National Science Foundation's Very Long Baseline Array (VLBA). The technique of very long baseline interferometry, or VLBI, has been around since the 1970s. VLBI combines the findings of multiple telescopes to create a composite picture, a process that can yield images 1000 times sharper than those from the Hubble Telescope, according to the Max Planck Institute for Radio Astronomy, where the data from all the telescopes was combined to create the image. In this case, the result was an image with the resolving power of a telescope nearly 63,000 miles wide, or almost eight times the diameter of the Earth. It may look smudgy, but it's the equivalent of a clear picture of a half-dollar coin on the Moon snapped from the Earth, the researchers say in a press statement. The image gives "unprecedented detail" about BL Lacertae's galactic nucleus, which is powered by a supermassive black hole 200 million times more massive than our Sun. “In BL Lac, we essentially look into the hottest cosmic hearth which is energizing matter so strongly that it would require achieving temperatures much higher than one trillion degrees, should we have tried to replicate these conditions on Earth,” Andrei Lobanov from the Max Planck Institute for Radio Astronomy, a co-investigator on the project, says.